A twisted, elliptical ring of relatively dense gas and dust around the Milky Way's center has been observed by the infrared Herschel Space Observatory. While a few portions of the ring, which stretches across more than 600 light-years (semi-major axes of 100 adn 60 parsecs), were observed before, Herschel's images in relatively long sub-millimeter, far-infrared wavelengths reveal the entire ring for the first time. Containing around 30 million Solar-masses of matter, the ring lies in the Central Molecular Zone within the Central Bulge, a region rich with cold molecular clouds of gas and dust moving within elongated orbits around the Galactic Bar. Oriented perpendicular to the major axes of the Galactic Bar, the ring contains gas and dust at a temperature of just 15 degrees above absolute zero, and bright regions depict denser masses of gas and dust that include some of the most massive and active sites of star formation in the galaxy. Past computer modelling have shown that galactic bars and rings can be formed by gravitational interactions, and such structures in the Milky Way's core even may be related to interactions with our largest neighbor, the Andromeda Galaxy. (Herschel news release; and Molinari et al, 2011). The central region of the Milky Way is dominated by a bar-like structure, which stirs up the material in the outer galactic disk as it rotates over millions of years and may be responsible for its spiral structure. Galactic bars are density waves that rotate around spiral galaxies with a speed different from the rotation speed of individual stars in the dense central bulge, much like the waves that create the spiral structure of these galaxies. 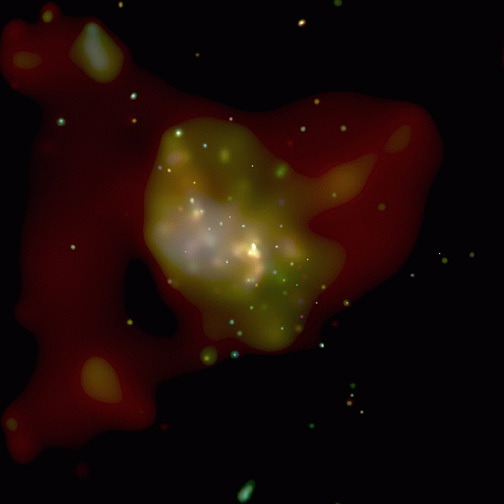 These density waves may be created by gravitational instabilities in the centers of galaxies, or by gravitational disturbances from nearby galaxies. As the waves rotate around a galaxy, they hold their shape like the blades of a fan. Gas closer to the galatic center moves faster gas farther out, which, combined with density waves, helps create the bar. 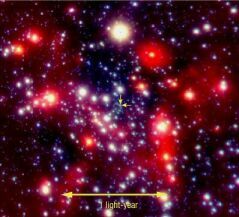 Larger and jumbo near-infrared images. view from the Solar System (more). S2 is a star that has been recently estimated to be located over 27,000 light-years away from Sol (Gillessen et al, 2008). It is located in the Milky Way's hot and violent galactic center, deep within its central bulge (more discussion from ESO press release with animations of orbital motion, the Galactic Research Center of the Max-Planck-Institute for Extraterrestrial Physics (MPE), and Astronomy Picture of the Day). From the perspective of Earth, the galactic center can be sighted at the western edge (17:45:39.95-29:00:28.2, ICRS 2000.0) of Constellation Sagittarius (see James Kaler's photo) the Archer -- west of Alnasl (Gamma2 Sagittarii) and W (Gamma1) Sagittarii, and Kaus Media (Delta Sagittarii); northeast of Kaus Australis (Epsilon Sagittarii); southwest of the Lagoon Nebula (M8) and open cluster NGC 6530; southeast of Kaus Borealis (Lamda Sagittarii) and Nunki (Sigma Sagittarii); and south of the Trifid Nebula (M20). 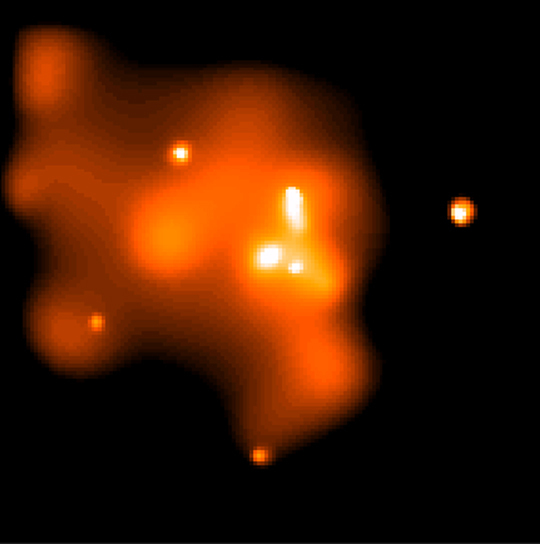 bright patch at center (more at Chandra X-Ray Observatory and Wang et al, 2001). 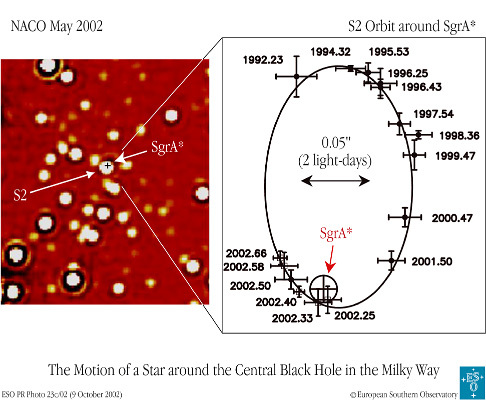 On October 16, 2002, the European Southern Observatory (ESO) announced that a team of astronomers (led by researchers at the Max-Planck-Institute for Extraterrestrial Physics (MPE)) had developed strong evidence of the existence of a supermassive central black hole in the Milky Way, by plotting out about two-thirds of S2's orbit around an apparent superdense object, using direct infrared and radio observations of the star's orbital motion since 1992. 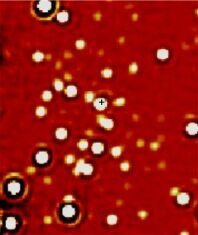 By 2008, ESO/MPE astronomers had observed a complete orbit of S2 as well as those of at least 27 other stars in the so-called "S-star cluster" in the "innermost arcsecond." (Gillessen et al, 2008 and ESO press release). No other currently known celestial object other than a supermassive black hole accounts for the observational and orbital characteristics found and the extremely high density of the central object estimated (MPE research introduction and MPE summary; Schödel et al, 2002; and Eckhart and Schödel, 2001). X-Ray Observatory and Baganoff et al, 2001). 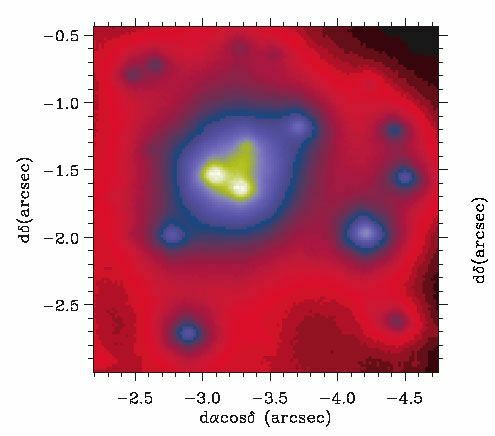 The galactic core is anchored by a black hole that has been most recently calculated to have around 4.31 million (+/- 0.06) Solar-masses (Gillessen et al, 2008). Based on theoretical calculations, its event horizon is estimated to be about 15.4 million km (16.5 million miles or 52 light-seconds) wide -- about 11 times Sol's diameter. Despite its size, the hole appears to be spinning so fast that it completes each revolution in about 11 minutes, at around 30 percent the speed of light. Although the hole is associated with the compact, radio, and x-ray source Sagittarius A* (Sgr A*), its faintness at all wavelengths, even in x-rays, has been puzzling as astronomers expected it to shine more brightly from infalling matter. The hole does occasionally flare from apparent infalling of large chunks of matter, but it appears that the Milky Way Galaxy's central black hole is relatively quiescent at present. Analysis of radio emissions from the area around the hole suggests that it is currently "starved" of matter -- as there is little "twisting" of radio waves from passing through magnetized plasma -- perhaps because a recent supernova cleared out matter around the black hole (more from Astronomy magazine). In 2003, two astronomers (Brad Hansen and Milos Milosavljevic) announced the probable existence of a middleweight black hole with thousands of Solar-masses that is dragging a cluster of young stars towards the Milky Way's supermassive, central black hole. Although the central black hole should be too massive to allow any new stars to form within three or four light-years because its gravity would tear apart any large clouds of gas and dust that would otherwise condense into stars, a cluster of stars less than 10 million years old has been observed to be located less than half a light-year from the central black hole. 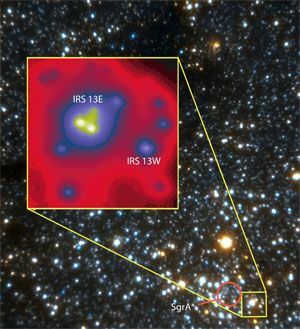 The cluster probably formed at a safe distance of at least five light-years away from the black hole, around a middle-weight black hole with around 1,000 to 10,000 Solar-masses. 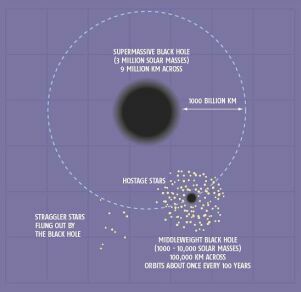 As the cluster's black hole has been gravitationally dragged towards its supermassive neighbor, however, it has dragged its stars along with it. The cluster has been orbiting the supermassive central black hole roughly once every 100 years. As the cluster spirals in towards the central black hole, however, it has been flinging out some of its stars to shed angular momentum as it spirals in. Eventually, it will fall in and add its mass into the larger central black hole. 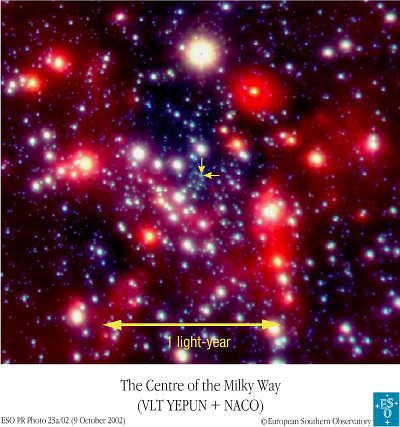 These infalls of mass should have occurred many, many times during the development of the Milky Way (Hansen and Milosavljevic, 2003). In 2004, a team of astronomers (Jean-Pierre Maillard, Thibaut Paumard, Susan R. Stolovy, and François Rigaut) announced the possible discovery of a middleweight black hole with around 1,300 Solar-masses orbit about three light-years from the central black hole, called GCIRS 13E, with strong x-ray emission (press release); nature.com; and Maillard et al, 2004). A compact cluster of seven massive stars (spectral type O and Wolf-Rayet, as well as a luminous blue object), each with five to 10 Solar-masses but reduced from more than 40 Solar-masses during their prime, orbit GCIRS 13E. 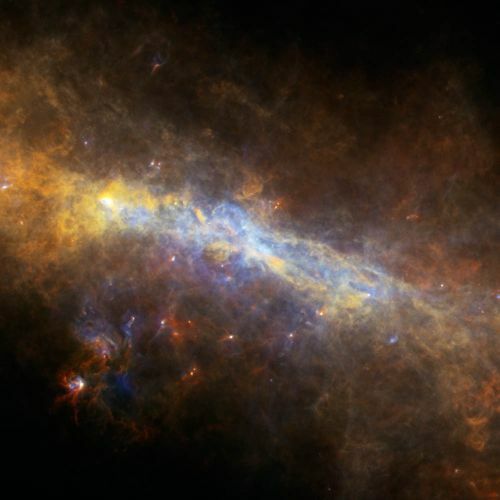 Just 0.065 light-years (0.02 parsecs) across, GCIRS 13E is racing around the galactic center at 626,300 miles per hour (280 kilometers per second). Indeed, the gravity of the nearby, supermassive central black hole should have precluded the contraction of gas clouds into GCIRS 13E's stars. 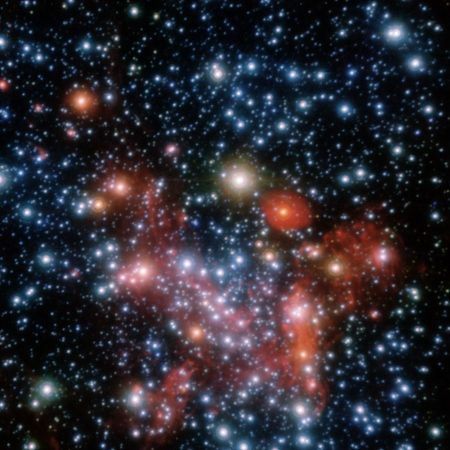 The astronomers believe, however, that the stars did form too far from their present location because the seven massive stars must be less than 10 million years old, or they would have exploded already since such massive stars do not live that long. Hence, the seven stars and GCIRS 13E must have migrated inward toward the central black hole within the past 10 million years, probably from about 60 light-years further out its current orbit. 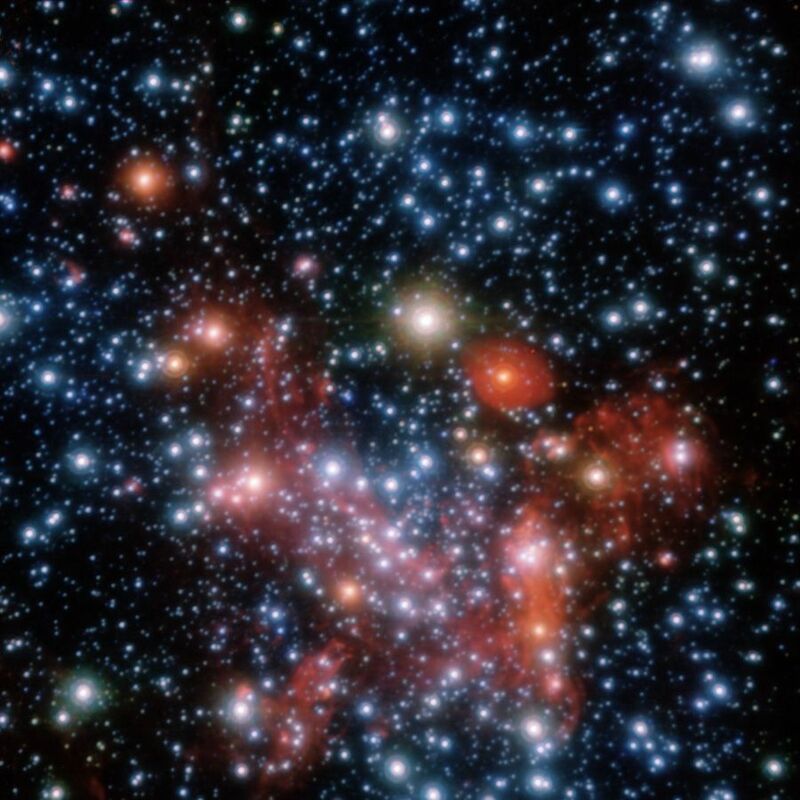 The seven stars are the remains of what likely was once a much larger and massive cluster of many stars, possibly a globular cluster where a middleweight black hole could develop through runaway star collisions, as indicated by other research. Melissa Weiss, Chandra X-Ray Observatory, NASA -- larger illustration. allowing infalling matter to orbit closer than a non-spinning black hole, at left. The gravity of a dense disk of gas (of at least 10,000 Solar-masses) around the central hole in Sagittarius A* apparently counters its tidal forces sufficiently for stars to form. 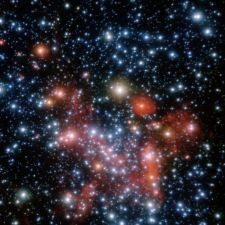 Moreover, local conditions have also favored the formation of a high number (around 100) of very young and massive stars. A corresponding failure to detect around a million of smaller Sol-sized stars suggest that the large stars formed locally, rather than farther away from the central black hole before inward migration to the region of the gas disk (more). Baganoff et al, Melissa Weiss, CXC, NASA -- larger illustration. 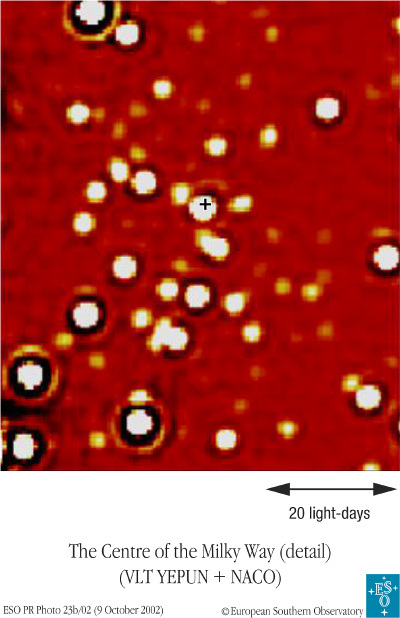 disk of gas within 0.3 light-years of the central black hole (more). S2 is apparently a "normal" star (ESO press release). It has about 15 times Sol's mass and seven times its diameter, and so, if it is a main sequence star, then S2 may be of spectral and luminosity type (early) B V (or even type O V). Given the frequency of supernovae at the galactic core, it is likely to be relatively more enriched than Sol with elements heavier than hydrogen ("metallicity"), based on its abundance of iron. Astronomy Picture of the Day). It is likely that any protoplanetary bodies that may have formed around S2 are still agglomerating other planetesimals, or have been lost to interstellar space or the black hole from gravitational perturbations. In any case, any developing carbon-based life on a developing Earth-size planet would be subject to tremendous heat and intense asteroidal and cometary bombardment, in addition to the intense and deadly radiation produced by supermassive black hole and nearby supernovae and other massive young stars. Neil Price has assembled images and maps of the galactic region around Sagittarius A*. In addition, images and a brief movie of a powerful infrared flare from hot gas falling into the central black hole on May 9, 2003 are available from ESO. Up-to-date technical summaries on this star may soon become available in the near future at: NASA's ADS Abstract Service for the Astrophysics Data System; and the SIMBAD Astronomical Database mirrored from CDS, which may require an account to access. © 2002-2008 Sol Company. All Rights Reserved.